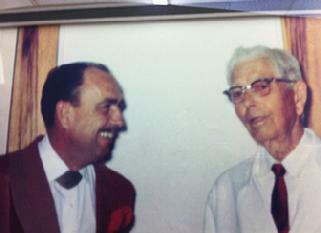 Dr. Robert Jones (L) and Dr. Charles Bass (R) together at the door of Dr. Bass' office. The dentists who went through this door came out changed. Collected works of Dr Bass are to be found HERE. Our organization was started by Robert G. Jones D.D.S., in 1961 on his family dining room table. Having acquired toothbrushes and dental floss from Dr. Bass for years, the supply was not up to the demand, and Oral Health Products was dreamed up. Dr. Bass, and the philosophy he taught, was still new then, relatively. Dr. Jones had been practicing for many years in Tulsa, Oklahoma after graduating from the University of Missouri, Kansas City dental school. Prosperous, with a growing family and practice, Dr. Jones still witnessed the pain and problems of patients daily. Could something be done to prevent the diseases he saw every day? Seeking an answer to his question, he found Charles Bass in New Orleans, learned from him the possibility of preventing tooth decay and gum disease and started teaching Bass' method to his patients immediately. He would go so far as to set up his microscope, take a culture and let the patients see the life in their mouth, all in order to get them to understand the necessity of cleaning the mouth daily, disrupting and disorganizing the plaque colonies, as Dr. Bass put it. He was even known to tell a patient that if they do not follow his advice, and clean their teeth like he showed them, he could no longer be their dentist in good faith, as they had exhausted his professional ability, and it would be immoral and a disservice to continue to take their money, only to watch over time as their teeth grew worse. That patient would always beg just one more chance, every time. It was untenable to Dr. Jones that he could just wash his hands, and say "Patient non compliance, not my problem" and go about his day. They were his patients, after all. Dr. Jones wrote his opinion of what preventive dentistry meant to him. Here is a letter written to a future dentist living in 2115. Hopefully, this letter will come true, in time. Do your patients talk about your current personal oral hygiene supplies like these patients do? The above link takes you to our patient testimonials page.